Swimming is Britain’s most popular participation sport. Nearly one in four people swim at least once a month, with around 80 million visits to swimming pools recorded every year. Surprisingly, although public baths have formed a vital part of community life since an 1846 Act of Parliament, their story has never been told in book form until now. 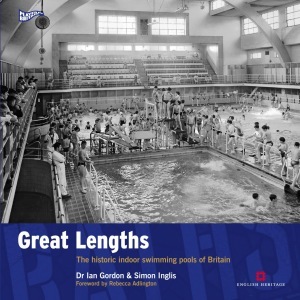 Great Lengths, the eighth book in the acclaimed Played in Britain series, traces the development of indoor public baths and pools, from the earliest subscription baths of the Georgian period and the first municipal baths in Liverpool in 1829, to the current generation of leisure pools with their flumes and potted palm trees. In both the public and private sectors the golden era of pool design fell between the 1880s and 1914, when over 600 baths were constructed, many rich in architectural detail and technological innovation. The magnificent Victoria Baths in Manchester completed in 1906 (2003 winner of BBC2 Restoration series) set new standards for opulence. Birmingham’s Balsall Heath Baths (1907), London’s Haggerston Baths (1904) and similar establishments in Hull, Nottingham and Glasgow equally reflected the civic pride of their creators, as greater awareness of hygiene and physical fitness brought safe swimming and recreation to the urban masses. A further burst of activity between the wars saw a new generation of concrete and glass Art Deco baths and in the 1960s these were joined by classic Modern designs. Great Lengths is no mere exercise in nostalgia. Scores of Victorian and Edwardian baths have been allowed to deteriorate. Dozens remain closed and the subject of long running campaigns for restoration. Yet many modern baths built in the late 20th century have also been found wanting. For this reason, this book will serve as an important reference for anyone involved in the current debate, whether as swimmers or providers. "Elegantly written and beautifully illustrated, Great Lengths evokes the power of historic pools to create a sense of community"
"Wonderfully evocative, hugely informative and entertaining illustrated history of 'the provision of facilities for swimming' with a resonance far beyond the architecture of 'the baths' into the very heart of Britain's social and cultural history."